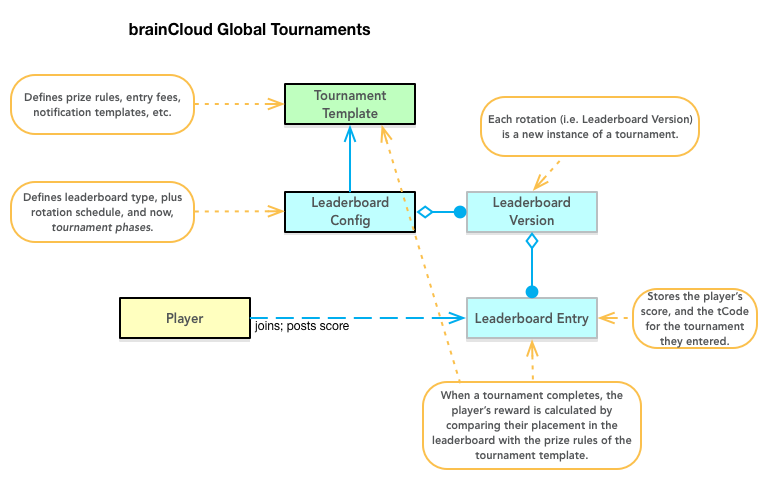 brainCloud’s new Global Tournaments feature is an entirely new system designed to amplify player engagement in your games. Global Tournaments are suitable for any game where competition centres around leaderboards. In fact, in their simplest version, Global Tournaments can be thought of simply as prize rules associated with a leaderboard. But as you will see, there is actually a whole lot more to them. When designing Global Tournaments, we had a specific set of goals in mind. Be flexible in terms of tournament schedule, phases, rules, payouts, etc. The Tournament Template defines the rules of a tournament – entry fees, prize rules, notification templates, etc. The Leaderboard Config defines how scoring works (highest score, cumulative score, etc), the rotation schedule, and also the pacing of the tournament phases. Each rotation of the leaderboard is a Leaderboard Version. All scores are stored by version in Leaderboard Entry objects. The same tournament template may be used by multiple leaderboards. This of course creates a separate tournament per leaderboard. Join Tournament – all tournaments must be joined before you can submit scores to them. Joining a tournament involves specifying the leaderboard that anchors the tournament, and the tCode of the tournament [template] that you are joining. An entry fee will automatically be deducted from the player’s currency balance if required. Post Tournament Score – posts an score to the tournament leaderboard. Note that you must pass in the epoch time that the game round started in, to ensure that the score is eligible. Note that there are several versions of this operation (see the API for details). View Current Reward – returns the player’s standing in the currently active tournament, and the reward they can expect to receive if they keep this rank. View Reward – returns the players reward for a completed tournament, and whether it has already been claimed. Will return an error if the player is not enrolled in the tournament. Claim Tournament Reward – claims the rewards for a completed tournament, incrementing appropriate player balances (currencies, etc.). For more information on these interactions, see the Tournament API. Tournament States are used to organize the larger tournament lifecycle. They determine when tournaments are active, processing award calculations, and available for award clams. Tournament Phases help to micro-manage when players can join tournaments, post scores, etc. throughout the Active tournament state. Note that brainCloud doesn’t explicitly tell you the phase it is in – instead, it gives you information as to when registration starts and ends, when play starts and ends, etc. When a tournament completes and they’re awards are ready to be claimed – sent to current participants. The system also sends an Event to the player’s event queue. Obviously, do not configure both Tournament Registration start and Tournament Play start if your tournament doesn’t have an exclusive registration period, or your players will get two back-to-back notifications, and be annoyed. Be careful about configuring Email-based notifications – we’ve included the trigger points, but for most cases we would recommend that you mostly use them to announce that a tournament is complete and that the player should come collect their prize. It’s also a handy opportunity to include info on other game offers, bonuses items to increase scores, etc. There are two types of designers. Designers who think that scoring notifications are cool, and those that think they could get annoying very quickly. And they are both right. If you post a new score, we reset the notification clock. This means that engaged players will receive more than one notification in a 24 hour period, because they’re actually responding to them. Global Tournaments offer an incredible way to increase engagement and monetization with your players – but what if you are just looking for a quick way to automatically add rewards to your weekly leaderboards – without code changes? Auto Join – Enables players to automatically join the tournament associated with a leaderboard, simply by posting a score to it (via the standard leaderboard PostScore method). Note that this only works for leaderboards that have one-and-only-one tournament associated with them – and that tournament must be free. Note – although we provide the Auto Join and Auto Claim features for convenience, in most cases we would definitely recommend that you implement the full tournament API. A key benefit to tournaments is engaging with your players – getting them excited about what they can win and adding that extra flourish as they claim their prizes. Auto Join and Auto Claim hide all that – minimizing the opportunity for extra player engagement. Global Tournaments are available across all brainCloud subscription plans. PostTournamentScoreWithResults() – adds 1 Bulk API count to cover the overhead of comparing the players previous and current tournament results, and determining whether to send notifications to displaced players. As compensation, however, returns the updated tournament results (essentially GetGlobalLeaderboardView()), hopefully saving the app an API call in return.